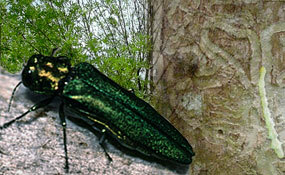 Emerald Ash Borer (EAB) has been found in Illinois. It was first sighted on Thurs, June 8th in the Windings subdivision in Lily Lake (west of St. Charles) in Kane County. It was positively identified by Friday afternoon. Illinois Dept of Ag (IDA) announced the find and their immediate actions this afternoon. See press release below. The size of the infestation is not yet known. Delimiting surveys are being done now. Quarantines will be established (after public hearings in about 30 days) once the extent of the infestation is known. There were hundreds of exit holes found on approx. 6 (18″ – 24″) ash trees over several residential lots. Adults were seen flying. It is estimated that the infestation is between 2-5 years old. EAB was most likely brought in on firewood. The subdivision is about 30 years old and ash cover is estimated at only 5%. No eradication action will take place until after delimiting survey is complete and adult EAB are gone in the fall. YOU ARE GOING TO GET A LOT OF PHONE CALLS! To make your life a little easier and to minimize stress on IDA and Extension, please do your part to screen calls from the public. If you screen effectively, it will save you time and trouble inspecting false alarms. Please do what you can to answer your resident or customer’s calls. I have developed screening questions to assist you , attached. If you have reasonable suspicion of an infestation, then and only then, contact IDA, Extension or APHIS. They have a lot to manage right now! And all of us have had a lot of training on EAB. I suggest you put the list of questions near the phones. Also have our EAB brochure and the USFS Pest Alert ready. The EAB brochure (attached) has helpful ash ID pictures and suggested response for the public. .
Bookmark http://www.emeraldashborer.info/index.cfm and http://na.fs.fed.us/fhp/eab/ for quick reference! The good news is that we are as ready for this as possible. Good luck.